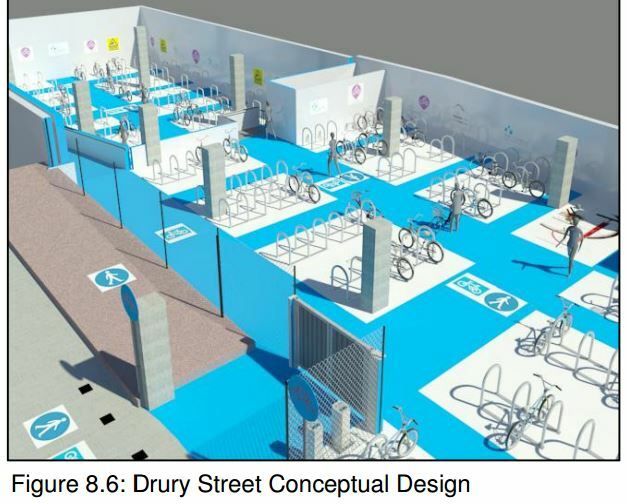 Planning permission was submitted recently for an upgrade and expansion of Dublin City Council’s bicycle parking unit at the Drury Street Multi Storey Car Park, located in the core southside retail area of Dublin city centre. The council owns the car park at the Fade Street end of Drury Street, and currently contracts the operation of the unit to Parkrite. The upgrade would mean the bicycle parking would come closer to the car park’s 465 capacity using a small fraction of the floor space. Double-height bicycle parking does not seem to be planned at this stage, although it may not be possable due to restrictive heights. The planning permission application includes a “pedestrian/cycle” ramp to link the new basement level bicycle parking with the existing bicycle area and for a wall to screen off the restaurant area at the front of the building from the proposedbicycle parking in the basement at the rear of the unit. Also included are upgrading of the following: the pedestrian entrance to the building, CCTV, fire detection system, fire escape routes. The planning reference file number is 3519/16 and the detailed plans can be found via this Google Drive link (thanks to Colm Ryder who commented below). The site notice says that the plans can be inspected at the council’s Wood Quay offices from August 15 to September 23. Submissions can be made in writing to the council’s planning section at Wood Quay before 4.30pm on October 7. The upgrade of the parking unit was proposed in the Dublin City Centre Cycle Parking Strategy Report (PDF) published last year. The report suggested some level of paid parking, but at this point it is unclear what mix of paid / free parking, if any, has been decided on. We are asking council for comment on this. This is great news. Thank you DCC for making this progress, lets see more of the same please. I would expect Dublin retailers to be delighted with this increase in capacity which will attract more shoppers to the city. The current capacity of 196 actually exceeds the total amount of cycle parking provided by Galway city council within Galway city centre. Is there any info on the current usage of the 196 spaces? The city is pretty maxed out with on-street bicycle parking – it’s getting really difficult to find bicycle racks (or poles) to lock to. A sign that more and more people are cycling, yay! Austin, the current usage is about ~60/70% at peak times. Which is quite high considering some of the 196 spaces are quite difficult to access with the current layout.